During a private, one-on-one meeting and a later working lunch with aides, the two leaders discussed a range of topics, including the Russian government's covert cyber influence operation targeting the 2016 presidential campaign and Moscow's illegal military operations the led to the annexation of Crimea and overall covert action to destabilizing Ukraine. Trump told reporters after the talks that the American relationship with Russia "has never been worse," and he blamed poor relations on both previous administrations and Russian actions. The four hours of meetings between the two leaders altered the poor relations and are a first step toward closer cooperation on counter terrorism and halting the spread of nuclear arms, Trump said in a press conference with Putin. "The disagreements between our two countries are well known and President Putin and I discussed them at length today," Trump said. "But if we're going to solve many of the problems facing our world, then we're going to have to find ways to cooperate in pursuit of shared interests." The attempt to reset relations with Moscow could be Trump's bid to play the Russia card against the growing threat of China by building closer relations. In addition to Russia's 2014 annexation of Ukraine's main industrial zone and subsequent subversion in eastern Ukraine, U.S.-Russia ties also are strained over the Russian intelligence operation to influence the 2016 election through hacking political figures and institutions, including the Democratic National Committee (DNC), and releasing the stolen emails online. Putin at the summit is seeking relief from biting economic sanctions imposed by the United States and Europe over the Crimea takeover. The Russian economy also is struggling as a result of low global oil prices. Exports of oil and gas are major sources of Russian revenue. Putin described the talks as "frank and businesslike" and said Trump during the summit reiterated the U.S. position on Crimea that the annexation of the peninsula was illegal. The Russian leader insisted the vote held in Crimea absorbing the territory into Russia was done under international law. On Russian election meddling that U.S. intelligence agencies concluded was a "cyber enabled influence operation" by Moscow to sway voters against Clinton, Trump said the topic was discussed at length with Putin. Last week, after more than two years of investigation, the Justice Department indicted 12 Russian GRU military intelligence officers for their role in hacking American political websites and spreading stolen emails and documents on Russian-created internet outlets as part of the election interference operation. Putin said he "did not know the full extent" of the operations by the 12 GRU officers but promised to look into the matter. He said the case should be addressed through a formal U.S.-Russia law enforcement cooperation agreement. Putin sought to counter the U.S. charges against the 12 GRU officers by accusing U.S. intelligence of secretly helping American businessman Bill Browder to move some $400 million out of Russia, something Russia is said to be investigating. Browder, CEO and co-founder of Hermitage Capital, lobbied for 2012 legislation that punished Russian officials called the Magnitsky Act. Browder told Fox News that the sanctions on Russian officials "hit the Achilles' heel of the Putin regime." Trump said he trusts his intelligence advisers but had questions about whether the FBI properly investigated a hacked DNC server. Putin provided an "extremely strong and powerful denial," he said. "My people came to me, [DNI] Dan Coates came to me and some others, they said they think it's Russia," Trump said. "I have President Putin; he just said it's not Russia. I will say this: I don't see any reason why it would be but I really do want to see the server." In a tweet on his way to Washington, Trump said he great confidence in American intelligence agencies. "However, I also recognize that in order to build a brighter future, we cannot exclusively focus on the past — as the world’s two largest nuclear powers, we must get going." Putin, for his part, again denied what he termed "so-called interference" in the election. "The Russian state has never interfered and is not going to interfere into internal American affairs, including election process," he said. Apparently referring to the controversial and discredited anti-Trump dossier produced by former British intelligence officer Christopher Steele that contained salacious charges of Trump in Russia and collaborating with Russians, Putin dismissed the claims. "After all, I was an intelligence officer myself, and I do know how dossiers are made up," Putin said. Asked directly if Russia holds compromising material that could be used to blackmail Trump, Putin said he had heard rumors that Moscow had gathered compromising material on Trump during a visit to Russia years ago, but dismissed the claims. Putin said he did not know Trump was in Moscow in 2013 and that an economic forum in St. Petersburg included more than 500 American business leaders, including Trump. "Do you think that we try to collect compromising material on each and every single one of them?" Putin asked. "Well, it's difficult to imagine an utter nonsense of a bigger scale than this." Russian intelligence agencies, including the GRU, civilian SVR, and the FSB security service are known to conduct extensive and sophisticated spying operations aimed at compromising visiting Americans in Russia. Trump, in response to a reporter's question about the Russian meddling, attacked Democrats for triggering the special counsel investigation led by former FBI Director Robert Mueller of Russian collusion during the 2016 presidential election, and he defended the stunning electoral win over former Secretary of State Hillary Clinton. The Russian meddling narrative, Trump said, grew out of Democrats' reaction to losing the election they had been expected to win. "We won the Electoral College by a lot: 306 to 223, I believe, and that was a well-fought battle. We did a great job, but just to say it one time again—and I say it all the time—there was no collusion. I didn't know the president [Putin]. There was nobody to collude with. There was no collusion with the campaign." "We ran a brilliant campaign, and that's why I'm president." Trump said he pressed Germany's leader, Angela Merkel, regarding a liquid natural gas pipeline deal between Germany and Russia over concerns Germany will become dependent on Russian energy. The president said the United States is emerging as a leading energy exporter and plans to compete with Moscow for gas deals in Europe. "So we're going to be selling LNG, and we'll have to be competing with the pipeline and I think will compete successfully, although there is a little advantage locationally," he said. Trump said he blamed both the United States and Russia for the decline in relations and for what he termed the "disaster" of the Mueller probe. "The probe is a disaster for our country. I think it's kept us apart, it's kept us separated," he said. "There was no collusion at all. Everybody knows it." "That was a clean campaign. I beat Hillary Clinton easily. We won that race, and it's a shame that there could even be a little bit of a cloud over it." The Mueller probe "has had a negative impact upon the relationship of the two largest nuclear powers in the world," the president said. "We have 90 percent of nuclear power between the two countries," he added. "It's ridiculous. It's ridiculous what's going on with the probe." Putin also raised a new propaganda issue that has been a central theme of Moscow's global influence operations: A proposal to ban space weapons. Russia is developing several space warfare capabilities, including anti-satellite missiles, according to U.S. officials, and at the same time has been proposing, along with China, a United Nations agreement to ban space weapons. The U.S. military is gearing up for space warfare although discussion of deploying weapons in space or capabilities for space warfare has not been disclosed publicly. Trump recently called on the Pentagon to create a separate military service for space warfare. On the Iran nuclear deal, Putin said he opposed the United States withdrawal from the Obama administration's Joint Comprehensive Plan of Action, an international accord to limit Tehran's nuclear program. Putin said the Iran deal put Tehran's program under international inspection. Trump pulled out of the deal in May rejecting the agreement as a one-sided deal for Iran. On Syria, the two leaders said they were seeking an agreement aimed at stabilizing the war-torn Middle Eastern state. "As we discussed at length, the crisis in Syria is a complex one," Trump said. "Cooperation between our two countries has the potential to save hundreds of thousands of lives." Trump said the United States "will not allow Iran to benefit from our successful campaign against ISIS." Iran is operating paramilitary forces throughout the Middle East, including Syria and Iraq. "We have just about eradicated ISIS in the area," he said. Senior national security officials from the United States and Russia are expected to hold follow-on talks on various issues, Trump said. "Today's meeting is only the beginning of a longer process, but we have taken the first step toward a brighter future and one with a strong dialogue and a lot of thought. On Capitol Hill, both Republican and Democratic leaders panned the summit. Senate Minority Leader Sen. Chuck Schumer said the president put in a "shameful performance" during the post-summit press conference that he said "strengthened our adversaries and weakening our defenses and those of our allies." Sen. John McCain, chairman of the Senate Armed Services Committee, called the Trump-Putin press conference at the Helsinki summit "disgraceful." "President Trump proved not only unable, but unwilling to stand up to Putin," said McCain who is battling brain cancer. 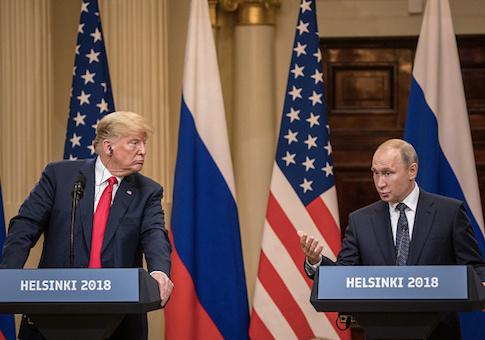 "He and Putin seemed to be speaking from the same script as the president made a conscious choice to defend a tyrant against the fair questions of a free press, and to grant Putin an uncontested platform to spew propaganda and lies to the world." Prior to meeting with Putin, Trump met with NATO leaders and criticized the alliance's members for not paying more for defense. The president also threatened to withdraw from the European alliance unless NATO members increase their contribution to the military alliance from 2 percent to 4 percent of their defense budgets. The president's criticism of NATO prior to meeting Putin appeared to be calculated to enhance his leverage in the meeting with Putin, who has been highly critical of NATO after the Moscow-led Warsaw Pact alliance was disbanded after the collapse of the Soviet Union in 1991. Prior to the summit, Trump tweeted that the U.S. relationship with Russia "has NEVER been worse thanks to many years of U.S. foolishness and stupidity and now, the Rigged Witch Hunt!" "President Obama thought that Crooked Hillary was going to win the election, so when he was informed by the FBI about Russian Meddling, he said it couldn’t happen, was no big deal, & did NOTHING about it," Trump said in another tweet. "When I won it became a big deal and the Rigged Witch Hunt headed by Strzok!" Senior FBI counterintelligence official Peter Strzok, under fire for threatening to derail the Trump presidency in a text message, denied during a House hearing on Thursday his political bias influenced his role as a senior investigator for both the Trump collusion probe and the Clinton email investigation.